The goal of construction at Wilbert’s Lakeside will be a larger, state-of-the-art facility that accommodates growth in business and more efficient, safer processing techniques. The new, more competent design allows for a higher standard in automotive recycling, which is essential for the health and safety of both our employees and the environment. 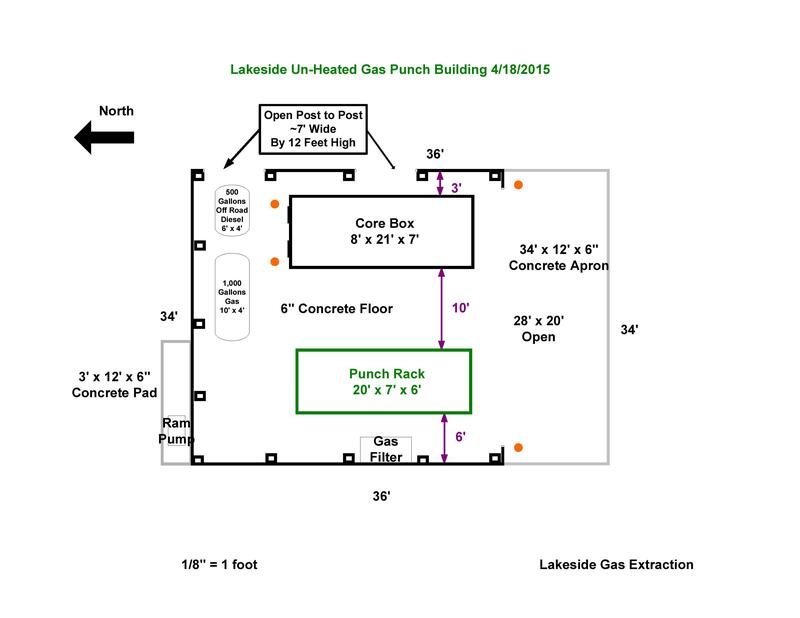 The first step in breaking ground at Lakeside will be a separate building for fuel recycling and core storage. Fuel drainage is an essential part of vehicle processing. To prepare the vehicle for placement in our lot, the fuel must be removed. Currently at Lakeside, the fuel is emptied by removing the gas tank from the vehicle and is then emptied into what is called a “gas buggy”. A gas buggy extracts the fuel from the vehicle and is stored there until it’s recycled. However, this creates more weight on the vehicle for the dismantler and comes with the potential hazards of handling a highly flammable substance. The new gas-punch building resolves these issues. Before the vehicle goes on to further processing, it will first be brought to this new building to be placed on a stationary rack. The gas tank will then be punctured and emptied completely, removing this step for dismantlers and keeping the fuel contained in the safety of this structure until further utilization. Engines and transmissions that are no longer functioning are referred to as “cores”. Rebuilding an engine or transmission is much more affordable than purchasing new, which is why the cores are still valuable- the individual parts can be reused. Currently, these cores are kept in a large bin sealed with foam insulation. Because these bins are kept outside, rainwater inevitably collects. Absorbent material is added to the bin to prevent any leakage from the cores. This is essential for the safety of our environment due to the presence of oil. The new structure for containing cores will be much more efficient in lessening environmental impact as it will be completely enclosed with a concrete pad underneath the bin. That means no collection of rainwater and no contact with the ground. The addition of this facility is physical proof of the strides we are taking at Wilbert’s to become the best in automotive recycling for our customers, our environment, and our employees. 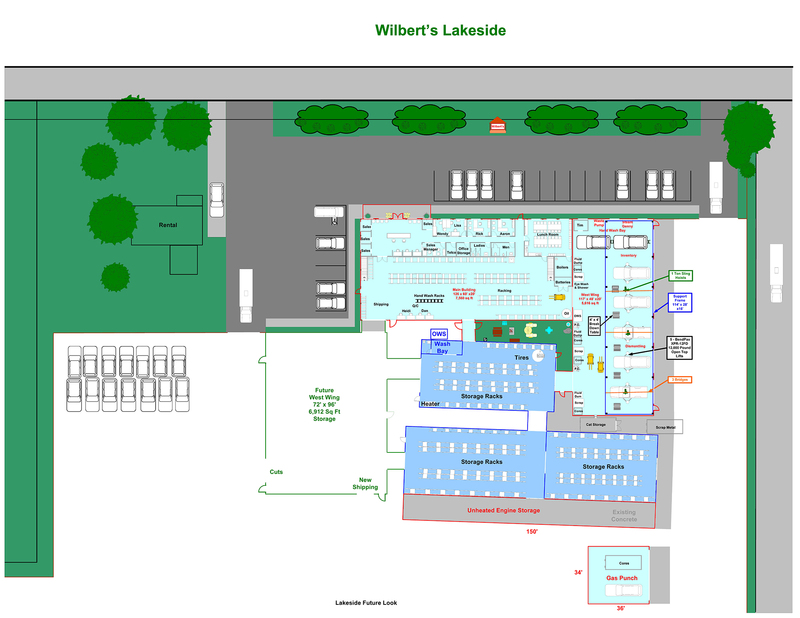 Wilbert’s Lakeside will be breaking ground on a 13,000 square foot building in the coming months to accommodate the growth of the business for years to come. In the beginning of March, the Wilbert’s family met with the Town Planning Board of Ontario and received approval to proceed with their plans for the proposed construction. 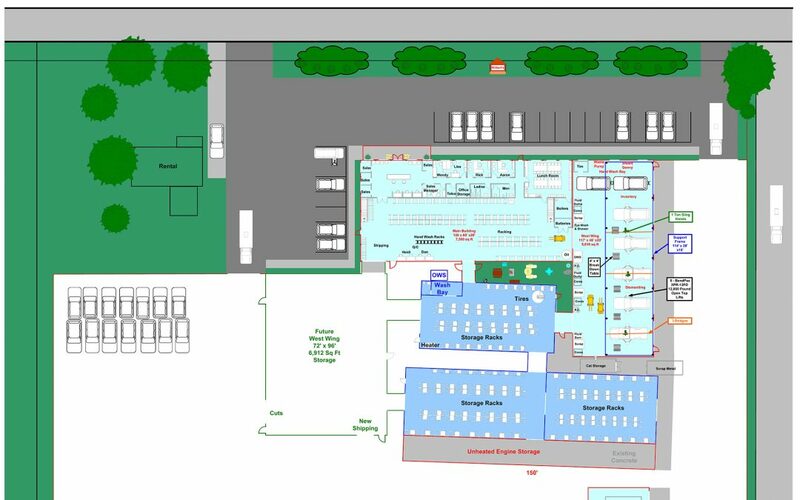 The new Wilbert’s Lakeside will include a state-of-the art dismantling area, allowing for the efficient processing of vehicles as well as increased production. To accommodate the increase in production, we are expanding our warehouse space by 7,500 square feet. Employees at Lakeside are already preparing for construction by clearing areas and leveling ground. Weather permitting, the projected date to begin is May 1st. One of the first additions will be a facility that allows for more safe and effective fuel draining. With the help of Fingerlakes Construction, our building plans are on their way to becoming a reality at Wilbert’s Lakeside. The Wilbert’s Family and employees are excited for the future with this investment and can’t wait to continue to deliver the high quality parts and service that the Upstate New York Region has come to expect.